If budget=text display, try Samba™ by Unitronics. Samba, an all-in-one, palm-size PLC with HMI and onboard I/Os, fills a growing niche—OEMs on a tight budget who need compact controllers for simple machine control, but still want the competitive advantage of an elegant, colour-touch HMI panel. The first model of Samba was released last spring; a few months later, Unitronics expanded the series, adding a model with a 4.3″ HMI panel. Now Unitronics is introducing a 7″ HMI panel for an even bolder display. 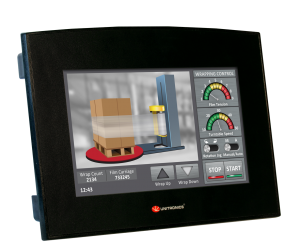 The beautiful HMI 16-bit touchscreen enables data entry and display of variable data, including colour Trend graphs and alarm screens. Samba supports 24 user-designed screens and 5MB images per application. The integrated PLC offers a broad range of features including 2 auto-tuned PID loops, time-based RTC control, data logging, recipes and more. The internal memory holds 112 KB of application logic, plus 512K for fonts and 5 MB for images. Onboard I/Os offer digital, analog, and high-speed functionality. The flat fascia and IP66/IP65/NEMA4X rating makes Samba an excellent fit for the food and pharmaceutical industries, anywhere spray or wipe down requirements apply. All Samba units come supplied with a programming port (USB for 4.3” and 7 “, RS232 for 3.5”). Additional ports can be added: RS485 or Ethernet, and CANbus port. Samba supports GPRS/GSM, email and SMS, as well as industrial TCP/IP protocols, MODBUS, DF1 slave, CANopen, and J1939; it can also be adapted to any 3rd-party protocol. Samba™ uses Unitronics’ free VisiLogic software. Visilogic provides a single, simple environment for hardware and communications configuration, Ladder application development, and HMI design, including a free library of industrial images. Free utilities include remote PC access and data export. Unitronics offers unlimited technical support for all of their products and supports an active user forum. Samba offers all the functionality system integrators need for small applications, reduces space and wiring requirements, and eliminates the need to set up Panel-PLC communication—resulting in an excellent price-performance ratio.